On the way to discovery of the first reported prehistoric grinding stone quarry in the Egyptian Sahara. 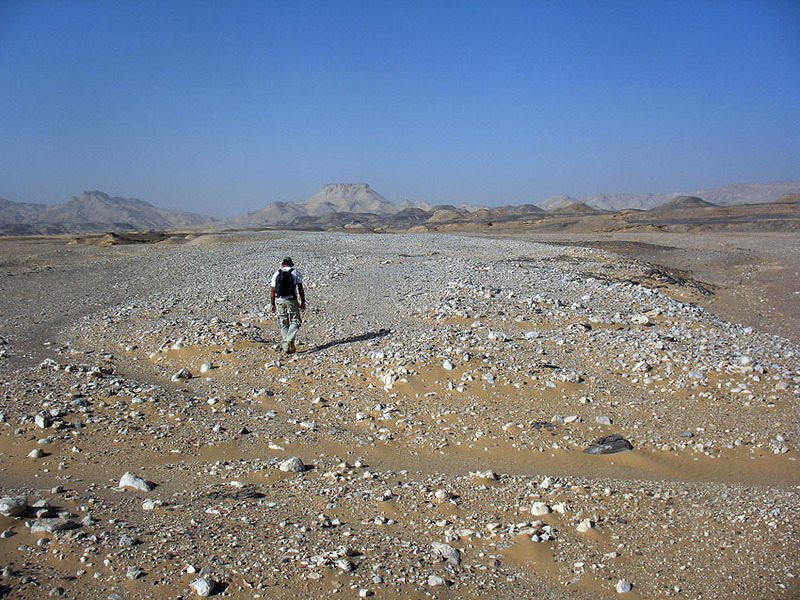 Dirk Huyge walks the stony desert. Photo: Per Storemyr. Some time ago I wrote about the discovery of a prehistoric grinding stone quarry in the Egyptian Sahara. Now the discovery is duly published! It was presented at the conference “Seen through a Millstone” in Bergen, Norway, in 2011. Recently, editor Lotte Selsing of the Archaeological Museum in Stavanger finalised the conference volume; an array of very interesting papers dealing with grinders and millstones across the world, from prehistory to the medieval period. Read on for abstract of my paper, get PDF and view a gallery of images. 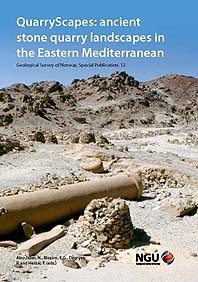 Storemyr, P. (2014): A prehistoric grinding stone quarry in the Egyptian Sahara. In: Selsing, L. (ed. ), Seen through a millstone. AmS-Skrifter 24 (Stavanger: Museum of Archaeology, University of Stavanger), 67-82. PDF at Academia.edu. 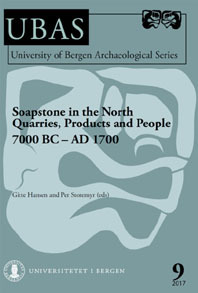 All papers in the volume “Seen through a Millstone” are open-access, and available at the website of Stavanger Archaeological Museum. The discovery was made on fieldwork with the North Kharga Oasis Survey (NKOS). This mission is still ongoing and directed by Salima Ikram and Corinna Rossi. …and enjoy this little gallery of images from the grinding stone quarry at Kharga! Satellite image showing important places mentioned in the text. This is a strongly tilted view, looking east, the scale only applicable to areas in the lower part of the image. Long arrow indicates the location of a main desert route, the Darb Ain Amur. Image modified from Google Earth. Small area of silicified sandstone work (in the foreground) on the alluvial terrace. Photo: Per Storemyr. Map of the environs of the grinding stone quarry. North is up. 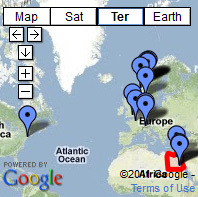 Map: Per Storemyr. Artefacts in the grinding stone quarries. A) and B) Broken lower grinding stone rough-outs. These are the most common artefacts in the quarries, C) Rare example of elongated, oval rough-out, D) sandstone, E) Photo indicating thickness (ca. 10 cm) of a lower grinding stone rough-out, F) Flint hammerstones in the quarries. Small scale is 15 cm long, folding carpenter’s ruler 50 cm in each direction. Photos: Per Storemyr. Collection of broken, oval lower and roundish upper grinding stones at the early-middle Holocene occupation site by Umm el-Dabadib in Kharga. Scale is 15 cm long. Photo: Per Storemyr. A depot of flint hammerstones on the alluvial terrace with views south over the Kharga depression. Photo: Per Storemyr. Location of the Kharga oasis and the grinding stone quarry (arrow). Map of Egypt modified from Wikimedia Commons http://commons.wikimedia.org/wiki/File:Egypt_Topography.png). Split Rock – an area of ancient campsites and rock art along a major desert route (Darb Ain Amur) about three km south of the grinding stone quarry. Photo: Per Storemyr. Sketch map of Quarry 1. Long arrows indicate (previous) water drainage. Map: Per Storemyr. Unworked block indicating how the silicified sandstone splits along bedding planes. Photo: Per Storemyr. Quarry 1, located on the little hill/plateau in the middle, upper part of the picture, as seen from broken-up slabs and blocks in Quarry 2. View towards the south. Photo: Per Storemyr. This entry was posted in Ancient Egypt, Archaeology, New publications, Old quarries and tagged Ancient Egypt, ancient egyptian quarries, grinding stone, Kharga. Bookmark the permalink.